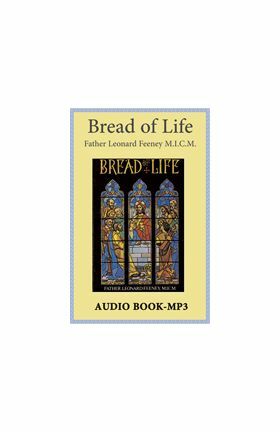 The twelve chapters comprising this magnificent work of Father Leonard Feeney were not the fruit of painstaking literary composition, rather they were drawn from the priestly heart of one who preferred to elevate the minds of live audiences. These series of lectures were put into written form by the author at the behest of his more enthusiastic and devoted listeners. Actually they were chosen as the most profound of the weekly Thursday night lectures that Father gave at Saint Benedict Center from 1942-1952. The two most significant, which are in praise of the awesome Mystery of Faith, the Blessed Sacrament, lend the book its Eucharistic title. One would have to have a heart of stone not to be profoundly affected by the deep devotion and wisdom which ring so eloquently from the sacerdotal heart of a theologian consumed with the charity of God as was that of Leonard Feeney. And, too, it was because of his great love of the Hidden Treasure on the altar that Father could speak with such filial devotion to Mary as one sees so beautifully expressed on nearly every page of this divine eulogium. Moreover, if you really want to know and savor the humility of our Emmanuel, plunge into the tangibility of an actual Bethlehem with a real manger, and learn to take God at His word in childlike simplicity (with all that that challenge implies), Bread of Life is a book you will find utterly refreshing.